Discovered by Caroline Herschel in 1787. Caroline Herschel discovered this cluster in 1787, when her brother William was absent. As usual, William Herschel included his sister's discovery in his catalog, and labelled it H VIII.77. 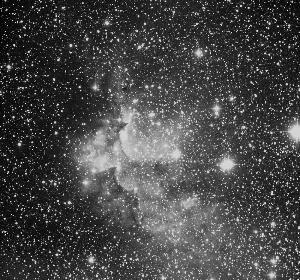 Open cluster NGC 7380 is nicely intertwined with a bright diffuse nebula which bears the catalog designation Sh2-142. The image in our webpage was obtained by Martin Germano. It was obtained with Martin's 14.5" f/5 Newtonian stopped to f/6 (12"), exposed 130 minutes on hypered Tech Pan 2415 film.